← Welcome back to the challenge! It is pretty much agreed upon by all scholarship that Luke wrote the book of the Bible that we call Acts of the Apostles. We know this because in both Luke and Acts we find the book dedicated to this person called "Theophilus". You can find those references in Luke 1:3 and Acts 1:1. In fact, at the very beginning of Acts we read about the "first book" that he wrote which we would be right in assuming was in fact the Gospel of Luke. So who is this Theophilus? I break the word down into two parts and we have Theo and Philus. From my writings, and if you have been in church on Sundays, you should know already what both of these words mean. Theo means God and Philus is from the root for the word that means love. So Luke is writing both the Gospel and this book of Acts to those who love God. I normally begin my letters: Dear friends and family of FPC. Luke, however, began his writings with the phrase: dear lovers of God. I think I like his way of beginning better. Well, a lot has happened. Jesus has spent three years with his disciples, he was crucified and much to the surprise of the disciples he was raised from the dead. The resurrection has already taken place when Luke picks up in Acts. In Acts 1 we begin with Jesus still with the disciples. The disciples are wondering if this is the time that Jesus will bring in the new kingdom, you know the Kingdom of God, that he talked about more than anything in his entire ministry. But Jesus responds and tells them that no, not yet, he still had to leave them with the greatest gift that God could ever give to us...Himself. The Gift of the Holy Spirit, which is God himself, was about to come next. But we are getting ahead of ourselves, that comes next chapter on the day of Pentecost. So for 40 days he stays with his disciples and he gives them a second Great Commission. Do you remember the Great Commission that we saw in Matthew 28:19 when he tells his disciples to go out into the ends of the earth? He does that again in vs.8 where he tells us that we will be his witnesses. There is a seminal work on the history of the Waldensian Church called "You will be my witnesses." If you are interested in learning more about this historical Protestant Church in Italy where Stacy and I began our ministry you can find this book here: http://www.amazon.com/You-Are-My-Witnesses-Waldensians/dp/8870160890 . So after 40 days from when Jesus was raised from the dead we find the biblical event of the Ascension. Here in Amish country Ascension Day is a big deal. It should be a big deal to us as Protestants as well. We believe that Jesus was taken up into heaven 40 days after his resurrection. That is what Ascension day is all about. Jesus literally ascended. It is part of our liturgical calendar that we celebrate, at least on paper, the day that Jesus left his disciples to take his place at the right hand of the Father. After the Ascension the disciples head back to Jerusalem to get to work to choose a disciple who would replace Judas who died in a field and his guts spilled out. Wait, I thought Judas hung himself? According to Matthew 27:5 he went out in disgust with himself after throwing down the pieces of silver given to him to betray Jesus and hung himself. There are some who would harmonize Judas' death and say that he went and hung himself and then his body fell and his guts spilled onto the ground. I'm wondering if the details are that important. What is important to this story is that at this point they needed one more apostle to run the church. Let's give a quick lesson on the terms disciple and apostle. An apostle is usually those twelve who followed Jesus. They then returned to Jerusalem, except for Judas, and ran the church. A disciple is a much more general term and is used to describe any, past or present, who would be a follower of Jesus Christ. So if you were a disciple of Jesus in Scripture, it did not always mean one of the twelve. You can be a disciple but not an apostle, but all apostles were disciples. But when the lists are given in the Gospels of the twelve disciples, except for the Gospel of John, they are called apostles. This book of the Bible is called the Acts of the Apostles and it refers to the work of the earliest 12 plus one. The plus one, as we will see later, is the Apostles Paul. So even today there are churches that still cast lots to choose their pastor. It is absolutely biblical, but it is not the only way that decisions are made in the Bible. I prefer the committee approach, but each church has its own tradition. 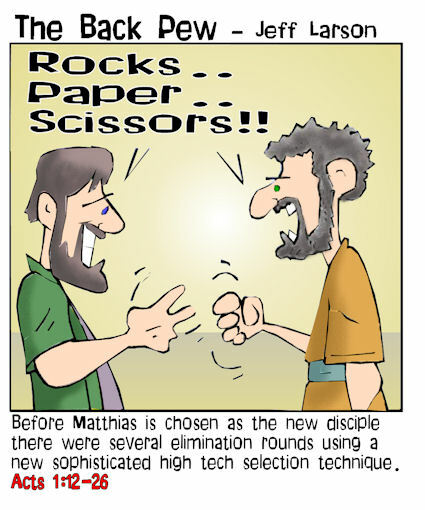 Here Matthias is chosen to replace Judas. This entry was posted in 90-Day Challenge II. Bookmark the permalink.